Have you seen these before? They’ve been around for the last nineteen years, and this is the first time that I’ve spotted them. Its funny the kind of stuff you’ll come across when you’re researching for a blog post. Whenever I see a mainstream manufacturer issue a product that isn’t card related at all I have to stop and look. Especially when its something as obscure as this. 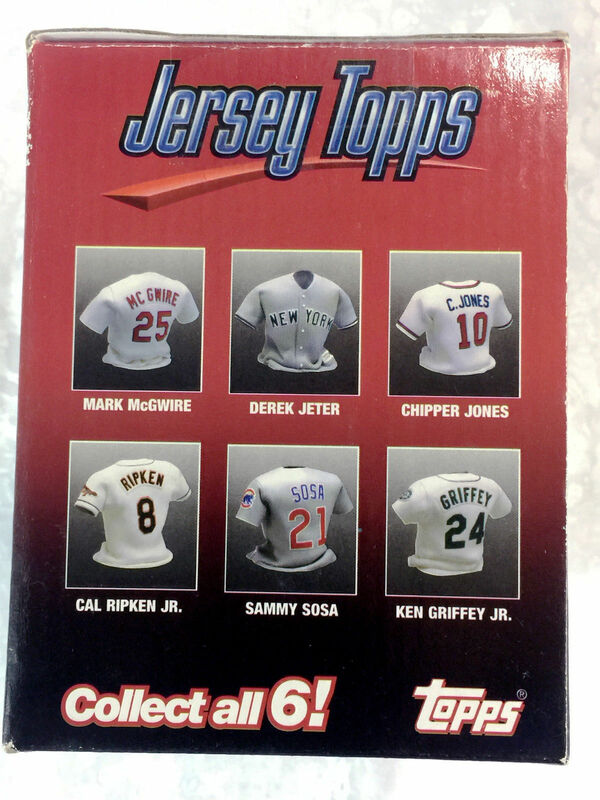 What we have here folks is Jersey Topps produced by the Topps Company in 1999. There isn’t a lot of information floating around about them. Mainly because they didn’t make it past the inaugural edition, and plus there really isn’t much to discuss in the first place. Despite existing for almost two decades, I wouldn’t be surprised if you hadn’t heard of them either. $10-$30 seems to be the going rate. No player collection should be without one… or a hundred. Why? Its a simple question that is asked quite a bit in this hobby. Sometimes you just have to wonder what people were thinking when it came to giving the “ok” to a new product. Maybe they deliberately wanted these products to flop just to create good blogging material twenty years later. If that’s the case, then I’d call it a success. Traditionally, Riddell is known for making sports equipment. Over the years though they’ve dabbled in the collectibles market. One of their collectible ventures came in 1998 with Game Greats. These miniature busts feature 360° wrap-surround digital imaging. That’s just fancy talk meaning they printed a digital picture and folded it into a loop. I guess using an actual image was the main selling point verses having a molded plastic face. Riddell made a series for both baseball and football. The baseball set consists of six players – Ken Griffey, Jr., Derek Jeter, Chipper Jones, Mark McGwire, Cal Ripken, Jr., and Sammy Sosa. Football has seven – Troy Aikman, John Elway, Brett Favre, Dan Marino, Kordell Stewart, Steve Young, and Barry Sanders. In order to obtain the Barry Sanders bust, you needed to mail-in three proofs of purchase along with the original register receipt. Barry Sanders wasn’t sold in stores like the others. If you didn’t want Barry Sanders, you could still request one of the other busts for free. Riddell offered a mail-in program for baseball too, but I’m unclear as to what you’d get in return. On the proof of purchase for the football busts, it states the exact name of the bust it came from. For example, the proof of purchase for the John Elway bust says “’98 Elway – Blue Jersey”. The proof of purchase for the baseball busts is a little different. For example, Mark McGwire’s just says “’99 McGwire”. Just like the football, the baseball busts were released in 1998. The checklist on the backside of the baseball packaging identifies them from 1998 too. So why do the proof of purchase for the baseball players state they’re from 1999? 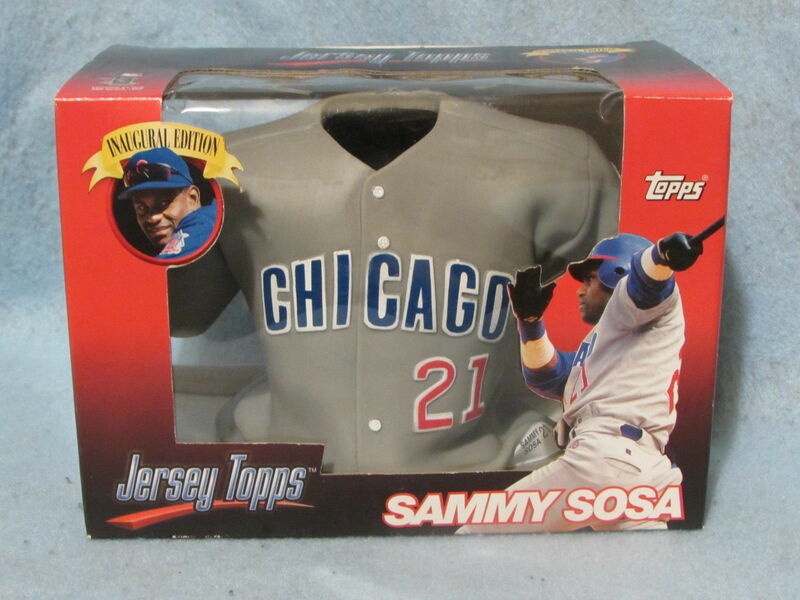 Unlike football, nothing is stated on the back of the baseball busts as to what you’d receive. I’m thinking the baseball proof of purchase were going to be used for a future product that never arrived given how poorly Release 1 sold. You can easily find these for sale. Sellers can’t give them away. It wouldn’t surprise me if someone at Riddell is sitting on a few rare prototypes. The odds are strong that at one time or another you ran into a Folz vending machine. Folz once had almost 200,000 machines spread across the United States and Canada. For awhile, it was the world’s largest bulk vending company. You could find them in mom-and-pop shops, grocery stores, and well known department store chains. 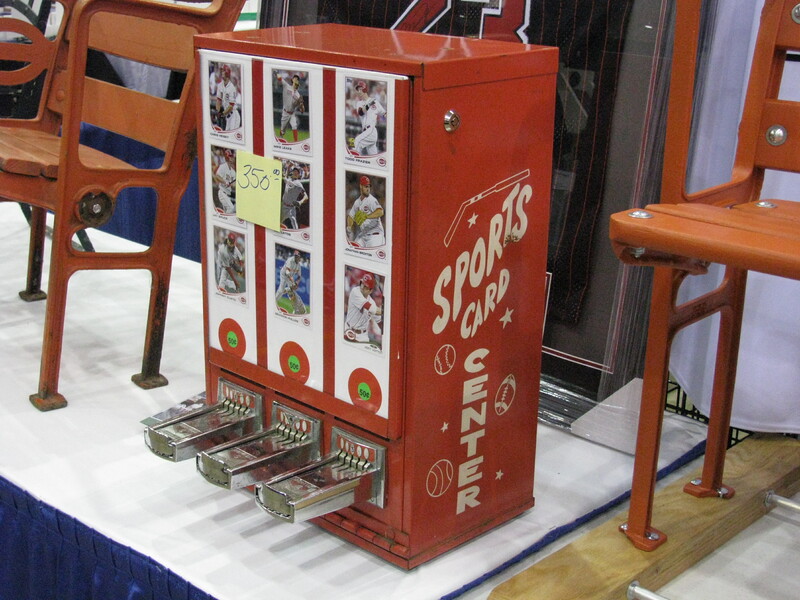 Their vending machines carried a variety of goodies such as candy, stickers, and even sports cards. In my day, I don’t recall running into many vending machines that dispensed sports cards. A card shop I visited while in Ohio had one. I gave it a shot and pulled a Troy Aikman from 1990 Fleer. It wasn’t until the 2014 National Sports Collectors Convention where I came across another. They make an interesting conversation piece. Upper Deck made a deal with Folz Vending that involved specially made cards. You’ll find that (1) baseball, (1) basketball, and (2) football sets exist. I’ve heard that a hockey set was made, but I have yet to find any cards from it. Designs look very similar to the Collector’s Choice sets that were released. Instead of the Collector’s Choice name, just the Upper Deck logo is found on the fronts. Photos on the backs reach all the way to the edges too. The biggest difference are the card’s overall size. They’re smaller in comparison to a standard sports card (2 5/16″ x 3 3/8″). Most likely so they could fit in the machines better. Sets consist of (48) cards. The first six cards in each set are short prints and contain foil on the front. Condition can be a big factor considering they were stored in vending machines. Back then, cards with foil were difficult to pull out of a pack in good condition let alone being stored and distributed in a vending machine format. All short prints carry a premium, especially the Michael Jordan. Although its not a short print, the Derek Jeter is highly sought after as well. Lets get one thing straight. Its “Folz” not “Foltz”. At first graders rejected these when they were sent in. When Beckett decided to grade them, everyone else fell in line. Because of a typo at first, some graded examples identify them as “Foltz”. When I was a kid, my go to toys to play with were action figures. I had bins full of them. Batman, X-Men, Star Wars, you name it. Like most adults I look back and wish I would have kept them in their original packaging. But where would have the fun been in that? Keeping toys sealed wasn’t even a thought. Outside of the action figures, Matchbox and Hot Wheels weren’t that far behind. I had a bin full of these too. Although I don’t live in the house I grew up in anymore, it wouldn’t surprise me if some of those toy cars are still lodged underneath a cabinet or something. The house’s current owner is probably completely oblivious that they’re still there. Long forgotten relics of a childhood race that perhaps got a little out of hand. 2018 marks the 50th anniversary of Hot Wheels. Twenty-five years ago Maxx Race Cards helped them celebrate their 25th anniversary with a commemorative set. Issued only in factory set form, the set features what they call “the most memorable 25 cars from 1968-1992”. The card fronts picture a Hot Wheels vehicle with a full-blown description on the back. Collecting tips are even provided for each vehicle. I don’t recall owning any of these specific vehicles. I do remember picking up a few Hot Wheels cars at a yard sale when I was little, and later discovered they came from their famous Redline collection. Maxx produced lots of racing cards during the classic junk-wax era. Most of their sets carry little value today. Cards of Dale Earnhardt are what they’re particularly known for. This Hot Wheels set is one of Maxx’s oddball products. Sealed examples are readily available, and can be found for nothing. 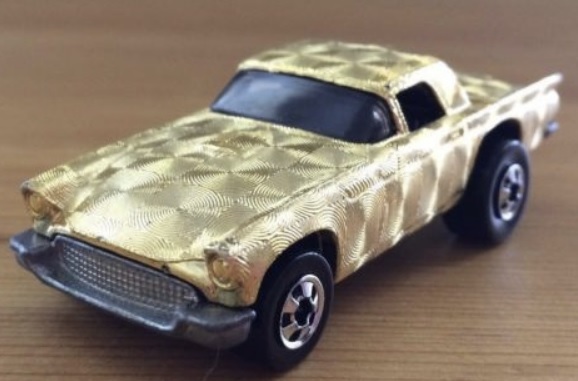 Doesn’t this Hot Wheels car look like a Superfractor?